HAPPY NEW YEAR MCL people old and new….yes I know it feels like ages ago now but this is my first 2014 blog whoop whoop! OK, so New Year was as expected a drunken affair with lots of rich food, late nights and lots of fun. Chris and I went down to Devon to spend with friends and stayed a few extra days and so whilst for most people their new year’s “diets” probably started new years day along with other resolutions of a healthy nature, I was weaning myself into a healthier way when we got back on Friday 3rd January in preparation for the first 21 day group commencing 6th January 2014. WOW, this is a mega group I have to say and everyone is so positive and posting loads of new recipes, as well as using the ebook along with Evie’s Friday recipes that I have to say are fantastic too! So, I headed off to the supermarket Saturday prior to the start to load up on all my herbs, spices and general ingredients that I tend to get from these establishments. I usually buy my veg and meat from the market and butchers, I do like to support my local community when I can, and you get a lot more for your dollar too. January in the City is quite easy to follow the plan as most of the people try to do “dry January” which I always find rather amusing as the rest of the year they cane it if you get what I mean, so I don’t feel as much pressure to have the “odd glass of wine” and so I take advantage of the situation. So the week started positively and I had planned ahead some new recipes as well as some old favourites, I made a batch load of chilli in my new Slow Cooker I got for Christmas (thanks mum) and had this for 2 lunches to start the week, nice and warm and very filling (bulked up with some veg). I also tried the Seafood Linguine for dinner and this is really yummy so recommend it for all you pasta fans. By end of Day 2 I am not going to lie, my calves were feeling really sore from exercising but I had also been to the gym to classes as well as the workouts so this probably added to the pain but I was starting to feel more like “me” and sleep was also my friend. I have told you this before on a few occasions but when I drink (lots) I find it really hard to get a good nights sleep and so it was bliss to have the sleep come so easy. In fact I was in bed 9pm Tuesday night and off like a baby, don’t think I moved an inch until alarm at 5.15 HEAVEN!! The rest of the week passes quickly, I had 3 client lunches to attend and a trip to the theatre and for the most part I managed to find healthy restaurants. On Weds lunchtime I made my client come to Pret with me for a salad, that was rather amusing as not sure they were over impressed by this but I think they are still talking to me, especially as I introduced her to Edamame Beans !! My energy has returned and I am starting to feel tighter and less bloated and so I am hoping that the results on Monday are going to be good. Either way, I feel good so that’s a good thing right? So, I am coming to the end of week 1 and it hasn’t been bad at all, in fact it’s been great, the group really helps and Jo is also doing this with us and I think she is too feeling the pain of the dreaded B’s especially the press-up variety EVIL but no pain no gain eh girls…..there are 3 of the bloggers in this group so something is telling me we all over indulged over the festive period a little bit too much and want to get back to on it. Everyone’s motivation is different, I want to lose a bit of weight to get back to my post Bootcamp level but I also just want to feel good, and I do, I am focussed and ready to take on the World, well my team and target for the year LOL!! So, I will sign off and look forward to Week 2 and everyone’s results as there are going to be some good numbers I am sure. 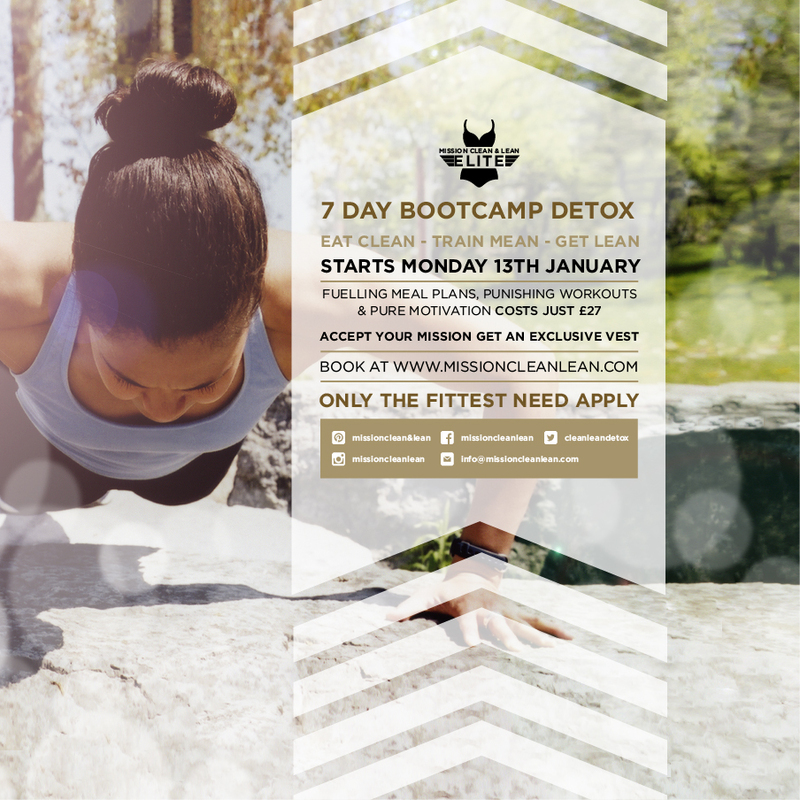 There is a Bootcamp starting this week and will be every Monday throughout January. Whilst the 21 day is similar to previous one’s there are some variations including smoothies and fruit so if you want to feel good and lose a bit of weight, hop on a group, you will not be disappointed…..
See you in a couple of weeks when I will have my final results and a six pack ……haha I wish! !